"Rust in Peace" is the thirty-ninth comic issue, which was released 1 October, 2008 in the US. The Planet Express crew go to a carnival where Fry fails at the ring toss and a carny uses Bender's manufacture date to cheat at guessing his age as ten. However, his age is much different, as the Professor soon reveals. He also reveals that Bender is past the company's retirement age. Bender adapts to retirement quickly, using it and "senility" as an excuse to be annoying and steal things. Fry on the other hand spends his free time trying to learn the skill of ring toss. While annoying people on a bus, Bender is the first robot to be found and taken by the Sunset Squad to the Near-Death Star, where he is soon attached to the facility's simulated Florida-like environment. Using clever cloaking devices invented by Farnsworth, Fry and Leela enter the Near Death Star, but when Fry's sheet gets snagged and falls off, they are caught and are attached to the system decades early. The peaceful suburban streets have been replaced by a casino city run and designed by Bender. Bender had been bored as soon as he arrived and started up a simple card game, the elderly liked it and wanted more, which he provided, but they still wanted more and eventually the world was reduced to the current state. 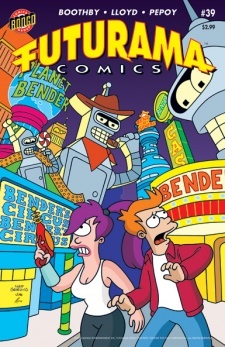 Fry and Leela learn where Bender is from a spruiker, but Bender no longer wants to leave. He says that he will go back only on the condition that Fry can throw a ring over his head, but Bender cheats. Despite having been addicted to the power, he soon changes his mind when Fry tells the elderly that Bender wants to hear about their grandchildren. The crew soon realise they have no idea how to get out, but then the designer of the virtual environment appears and shows them the way out, on the condition that they never return. As they begin their run from the draws to the ship, the guards appear, but Fry takes a pair of 'o's from a sign and successfully throws them over the guards, immobilising them. Back on Earth, Farnsworth transfers all of Bender's memories into a new Bending Unit body, making him legally only minutes old and allowing him to return to work. Zoidberg is Sal's doctor and has given him three hours to live, but meant to say decades. Given his incompetency as a doctor, these are likely to both be wrong. This is the first comic to show the last names of the crew for the comic as title caption. The professor downloads Bender's personality/memories into a back-up unit, it is later revealed that Bender was built without this ability "Lethal Inspection". Fry: Leela, we have to help Bender escape from a planet in another galaxy! Leela: That's the third time this month! The Needy Newbies return, which is a very rare thing for something originating in the comics to do. Lovey Bears also make their second appearance. Popplers are once again being sold. Bender's Big Score is directly referenced, and plugged, as the plot relies on the time travel causing him to age several thousand years. In the second frame he appears in, the age-guessing carny's red vest changes to the green of the rest of his casing. Bender's age is [mis]identified as 27,203. Additionally, carbon dating shouldn't work on a robot. Leela says that robots don't believe in ghosts, but Bender clearly does during "The Honking". This page was last edited on 16 December 2013, at 21:22.